Bowlers Rock Lightship – Chesapeake Chapter U.S.L.H.S. A total of two lightships were stationed in the upper Rappahannock River approximately 34 miles above its entrance into the Chesapeake Bay and approximately 8-1/2 miles downriver from the town of Tappahannock to mark a rock on the east side of the channel. From 1835-1861, LV” O” served the station. This was a wood framed ship with two lanterns with one light placed between two square posts. There was also a hand operated fog bell. In 1861 the ship was destroyed by Confederate forces. The ship and its crew’s fate remain unknown. From 1861 through 1863 the station was vacant. After the war, LV 28 was stationed from 1864 until 1868 when the new screwpile lighthouse was commissioned. The ship was an 82-foot long, 83-ton wood framed schooner that was built in 1864 at Norfolk, Virginia at a price of $16,000. It carried a single lantern with eight oil lamps a hand operated fog bell. There was an iron hoop day marker on the mast. Prior to 1867, when LV 28 was assigned, official records identify the vessel as Bowlers Rock Light Vessel. 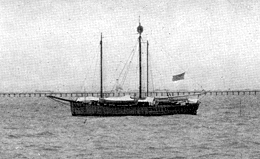 After its service at Bowlers Rock, it was sent to the Gulf of Mexico and remained there until it was retired in 1906. 2. Lightships-Floating Lighthouses of the Mid-Atlantic, Wayne Kirklin, 2007.